My First Stuffed Squash — Happy Dance! You all know I’ve been trying to eat better – it’s been a slowwwwwwwwwwww process since I’ve only recently began chopping and grilling. But with the tips & support from so my friends, I’ve been assembling lovely dishes with real ingredients. I’ve learned that if I assemble food with ingredients that I like, then chances are it will work just fine. I’d heard about acorn squash and saw them at the store, so I picked a couple up. (They sat on the counter a few days because I was scared.) Of course the apples are great right now and I had several. I always have nuts (one of my favorite staples.) And my new favorite treat is pomegranate seeds from TJ’s (If you haven’t had them, give them a try — crunchy, sweet goodness & a great topper on grains and salads.) Yes, I had all the ingredients on hand – which is KEY for my eating well (rocket science, eh?). Tonight’s milestone? My first stuffed squash. Special thanks to my friend Michele at Seasonal Custom Cuisine. She really deserves her very own post — everyone learning how to prepare healthy foods should have their very own Michele as their cooking counselor. And Barb @VinoLuci is amazing and PATIENT! She has tweet coached me through many an adventure in the kitchen, and I am so grateful to her. 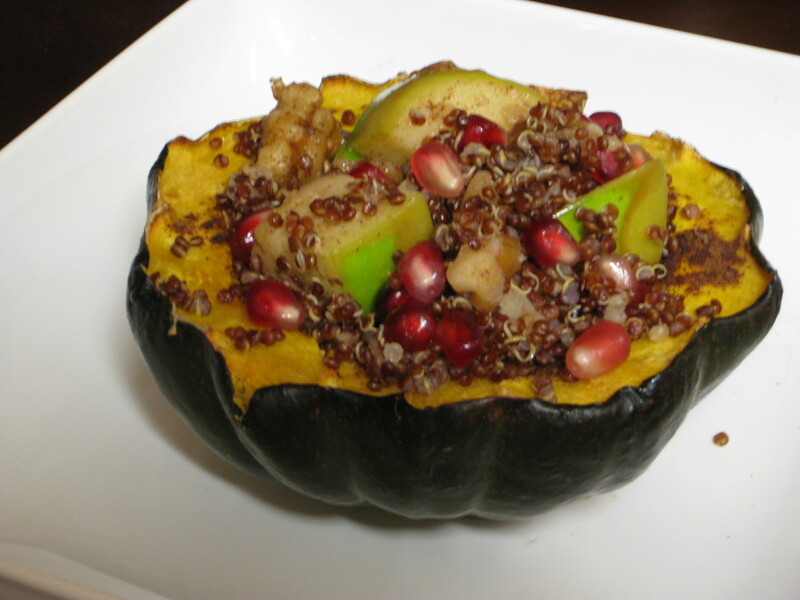 Mix the apples & walnut mixture with quinoa, add in the pomegranate seeds & stuff the squash — VOILA! I’ve been watching the Mamavation tweeps and have been inspired towards their commitment to clean eating and physical activity. One of the commitments is no sugar. I’m super sensitive to this and am not sure if the maple syrup counts or if it’s specifically processed sugar that folks are avoiding. Either way, I know for me, I have been paying attention to the “non-sugar” “sugars” that we get in foods and how our body processes them. So in good faith and being the eternal student that I am, I went to the Glycemic Index site to do some comparative research and see how maple syrup compares to other foods in terms of its “sugar”. I also learned that a TBSP of Maple Syrup is about 20 grams ( TYVM @katieheddleston ). So are any of you doing anything special with fall squash? I’d love to know! Also, anyone else out there paying a little bit of attention to the glycemic index stuff?